The primary focus of my blog revolves around saving money, without sacrificing the pleasures of life. Therefore, this type of fitness review might not be applicable to you or your situation. I am of the opinion that the BodyMedia Fit is very much aligned with many of the tactics I follow in life. As I have stated in prior blogs there is no such thing as too much data. From a financial standpoint you need to know where every dollar is earned and spent in order to make meaningful changes to your financial situation. In the savings world it’s a simple equation of income – expenses = savings or debt. So as long as I am making more than I am spending I am in good shape. Ultimately you would like to have enough money left after expenses to set up a nice savings for emergencies and future, but it all starts with knowing your numbers. Knowing your numbers is what the BodyMedia Fit is all about. It’s a small little device you wear on your left tricep and it tracks your daily fitness activity. The equation is very similar for weight loss and finances. Calories In – Calories Out = Fat or Not. In this case the savings portion would be fat depositing itself to your midsection. If you burn more calories through activity than you ingest through food then you will lose weight. Actually every 3,500 calorie deficit should equal 1 pound of fat lost. Knowing your numbers is essential to improving your health. While there are many different excellent programs to track weight and log daily food intake, the options to show calories burned are not as abundant. The best part about this gizmo is that you need not be a fitness guru to tap into its immense value. My activity log goes back to February 2011, when I first bought my BodyMedia Fit. Over this time I have gone some stretches without wearing it, but for the most part I have data for the past 2 years. With this data I can see how my weight has fluctuated based on my activity level. I have a very solid baseline so that I can actually see if any particular day is more productive than my average activity day. The BodyMedia Fit, for me, is less intrusive than wearing a pedometer around and provides very accurate data on the number of steps taken. 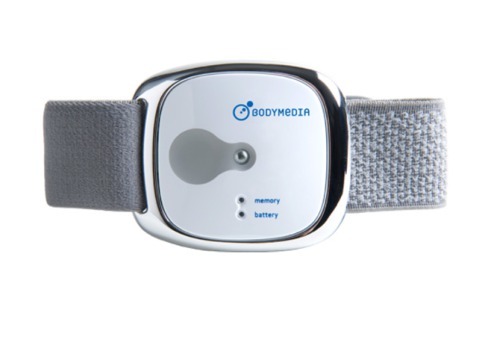 The BodyMedia Fit acts as a pedometer on steroids though. It not only tracks the number of steps taken, but the intensity of the activity. The device sits against your skin to detect subtle changes in temperature, moisture and movement and analyzes all of these data points in some sort of proprietary magic. The BodyMedia Fit website states that the device analyzes 5,000 data points per minute, while I cannot independently confirm this I do know that it just works. When you are running around and being active this device will measure the number of calories burned. Whether this number is totally accurate is difficult to say, but if the activity manager says I was active at a certain time, it coincides with my actual activity levels. In addition to measuring your activity it is also a useful tool to measuring how many hours of sleep you get per night. Again, I am not certain how this works, but it is very interesting to see. Ever have a night where you go to bed early, but wake up the next day feeling groggy? This device does an excellent job of calculating the number of hours you spend in sleep and also measures sleep efficiency using the number of hours laying down versus the number of hours asleep. Reading the review so far, it should be obvious that I think the BodyMedia Fit is a great product, but that does not mean it is without its faults. My primary gripe revolves around its subscription based website model. Sure, many products are moving to cloud services, but that does not mean I need to like it. I would rather buy the device and then load the data to my computer every day without the need for a monthly bill. At $7.00 a month that’s pretty expensive and prohibits all but the most dedicated fitness gurus from sticking with the program. Earlier this year they offered 1 year packages for $59 and 2 year for 89. I signed up for the $89 2 year membership and find this to be much more reasonable. However, it seems that they have gone back to their previous monthly fee which is disappointing. I also have the Bluetooth version of the BodyMedia Fit and have found it difficult to connect to my Galaxy S2, but no problems with my Galaxy Note 2. Overall though the Bluetooth is a bit buggy and not a great addition. I definitely enjoy the BodyMedia Fit and actually own 2 of the units. I bought the Core in 2011 and bought the bluetooth enabled device in 2013. I do not feel like the Bluetooth model is worth the extra money because I find it annoying to have to pair the device on multiple occasions. Overall I recommend this device for everyone as it tracks your activity and sleep throughout the day. I wear mine around the clock and never run into any issues. My sister bought the same unit and she finds it to be too noticeable on her arm and instead of embracing her healthy lifestyle she is embarrassed by the unit and wears it less frequently than I. If you are interested in buying one of these units I would recommend doing so, but look into signing up for a yearly package to make it a better deal.